Quitting smoking is difficult, yet not impossible. While some are successful quitting by going “cold-turkey,” others need help and support to stay on track. Frugally Sustainable offers several support methods for those ready to quit. They explain seven ideas of things you can do that will physically and emotionally encourage you not to smoke. Additionally, they share a list of seven herbs and eleven essential oils helpful to detox, curb withdrawals, improve lung functioning, restore health to the digestive and nervous systems, and help alleviate feelings of irritability, anxiety, and stress. 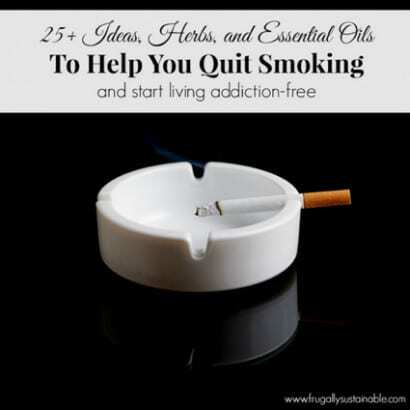 Not only to they list and explain each herb and essential oil, they also provide five recipes that you can make to counter the difficulties associated with quitting smoking and rebuilding your health.